Which words are there that actually contain my relevant keywords? The Patchword tool answers this question. It is helpful for those who are looking for puns or just need some clever inspiration. You will get particularly good results with short input words. The Patchword tool finds words which contain your keywords. It allows you to come up with inspiration for puns and clever names. The Patchword tool allows for different search types. You can search for words that contain your keyword at the beginning, at the end, or at any position in the word. If you enter cat, for example, you will receive results such as location, catalogue and snowcat. Suppose your project is about books. Thus, book would be a central keyword would book for your project. 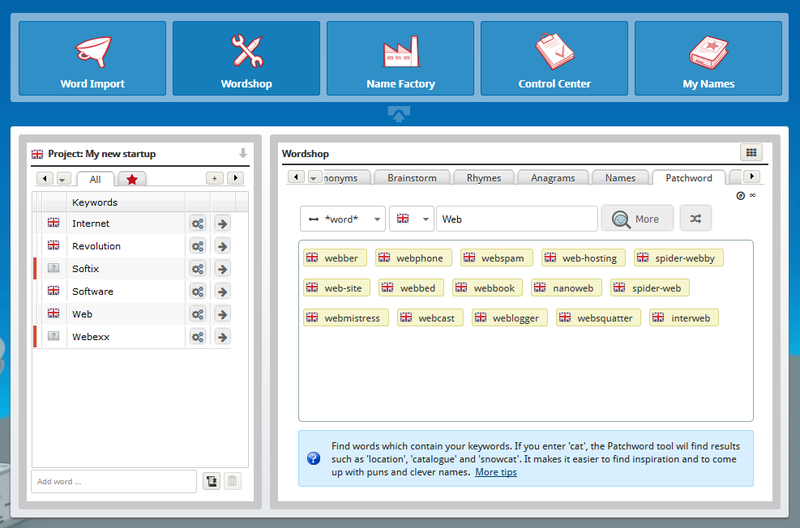 Simply add the keyword book to the Patchword tool and find all words which contain you keyword, such as notebook or bookmark. Enter only one part of your keyword book, namely ook. Now tackle the creation of a rhyme or pun, e.g. BookLook or a witty invention such as Booklyn. Wouldn't that be a charming name for a book store or a literature website? Test the Patchword tool now! You can test the Patchword tool right here on the page and perform up to five queries. In the Patchword tool, you enter a single word (or part word) and find other words which contain it. Go to the Patchword tool in the Wordshop right now to test it out. If you don't have a NameRobot account yet, simply register and start looking for inspiration.